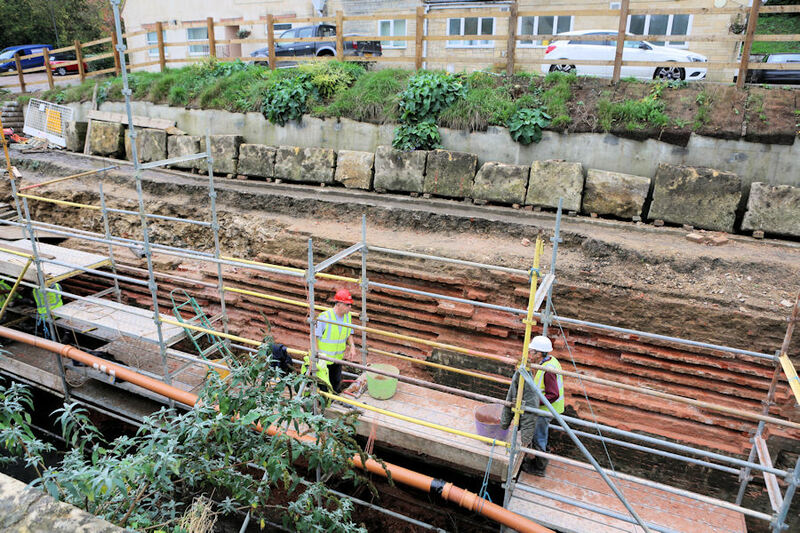 A week-long Canal Camp visit by Waterway Recovery Group (WRG) and a weekend visit by Newbury Working Party Group (NWPG) has been followed by weekday work carried out by Stroud District Council’s 'Tuesday & Thursday Team' volunteers. WRG’s specialist Forestry Team recently removed the fallen or leaning willow trees and other obstructive branches east of the lock. 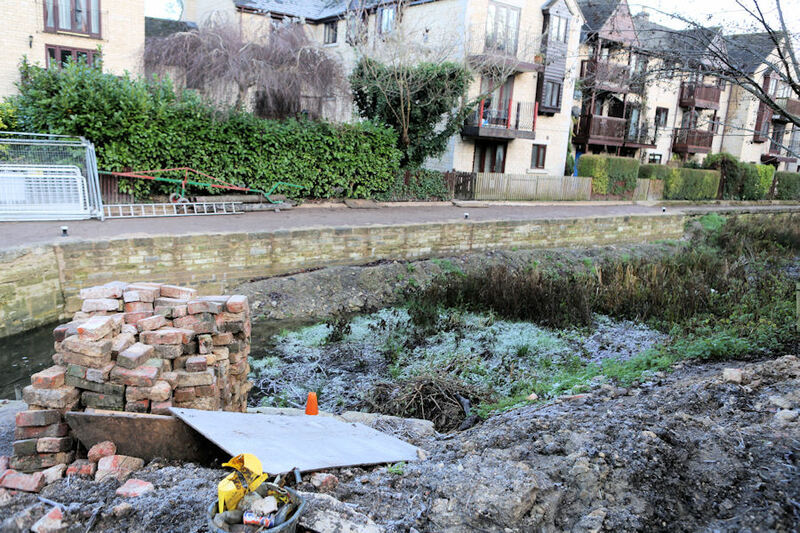 This will allow unimpeded navigation between Bowbridge Lock and Stanton's Bridge. Despite problems with water ingress and pumping out the lock chamber, much progress has been made within the lock and surroundings. The chamber wall on the offside (Veterinary Surgery side) has been stripped of defective bricks ready for rebuilding. Work has now commenced in stripping the defective brickwork within the bottom gate recess. The wooden fencing along the towpath side of the lock has been removed for re-use elsewhere. Removal of the fence has created much needed space on the lock side. The towpath wall rebuild is now complete and has had mooring bollards fitted. The towpath along the length of the wall has been re-surfaced. The Tuesday and Thursday volunteers have cast a concrete cill beam and installed bottom stop planks, allowing the lock chamber to be isolated from Bowbridge Bridge. 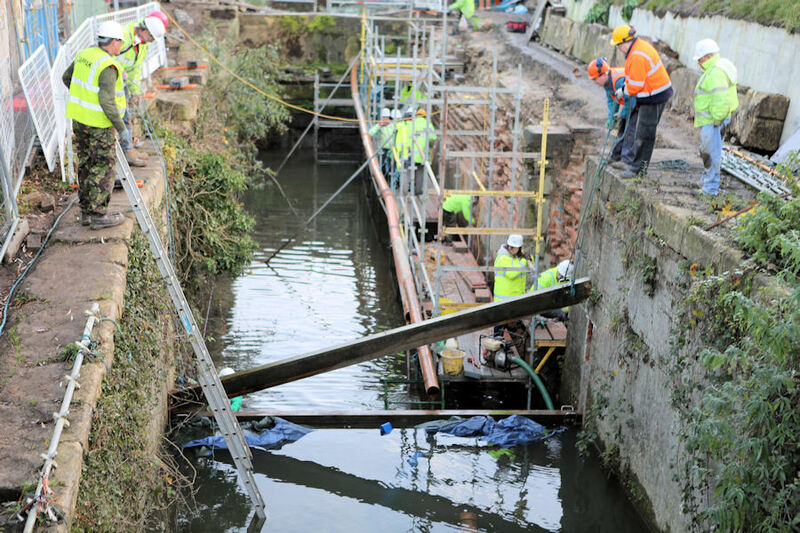 The teams can now clear any remaining silt, install more scaffolding, and commence the rebuild of brickwork on the towpath side. The work described above has been assisted by a generous grant of £20,000 received from The Association for Industrial Archaeology (AIA). The AIA is the national organisation for people who share an interest in Britain's industrial past. It brings together people who are researching, recording, preserving and presenting the great variety of this country's industrial heritage. Would you like to join the 'Tuesday & Thursday Team'? Please contact Jon Pontefract on 07986 351 412 or Paul Weller on 07896 426 317 to join in the fun. Alternativley, click here or here or on the icons below to become a wrgie or Cotswold Canals Trust volunteer.